Before having a baby, I hadn't thought about many of the challenges that would come along with a little one. (The crying, for example. Oh my gosh the crying. I naïvely thought that babies only cried when they needed something and if their needs were met they didn't cry much. Maybe this is the case for some magical babies out there, but not mine. I was not prepared for the crying.) One thing I did think a lot about, unsurprisingly, was food. I was barely pregnant when I was thinking daily about how my little one would not EVER be ordering off the "kids menu." I read Hungry Monkey and French Kids Eat Everything, and formed a lot of strong opinions about how kids should be eating and what is wrong with how a lot of kids in our country are fed. Now, who knows what will actually happen...I'm sure there will unfortunately be quite a few chicken tenders in our future. But nevertheless, I set some mental goals for how I want to feed W, and how I hope she'll eat. My main principle has been to try my best to feed her whatever we're eating, as early as possible. 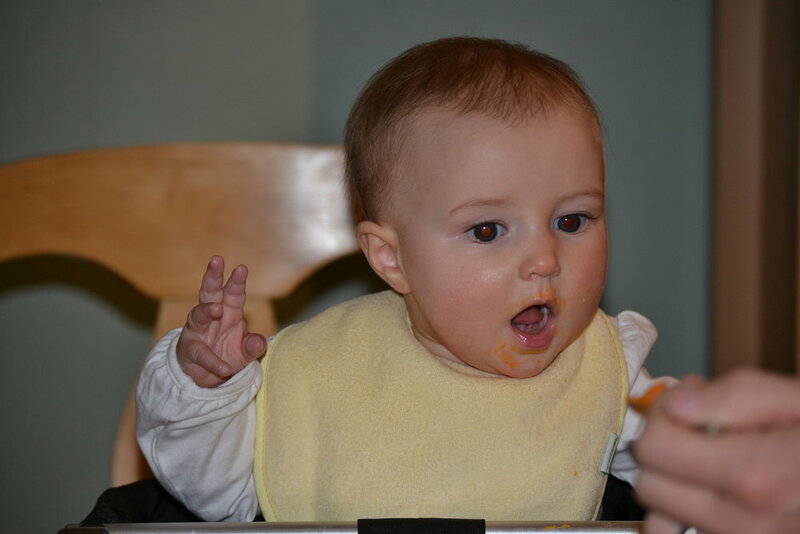 Since she started solids at 6 months, she's tried quite a few new foods. 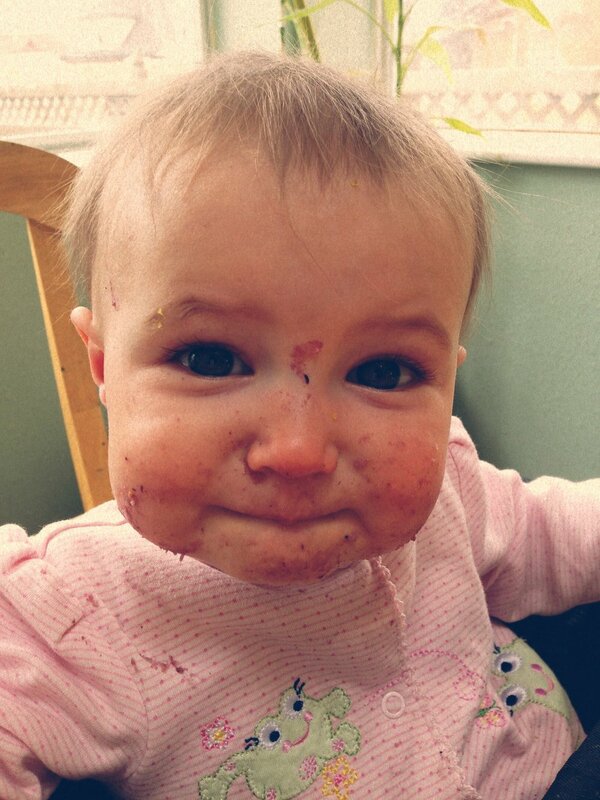 I started off making purées of mostly vegetables (didn't have her try fruits until after 7 months) but by 8 months she was pretty much done with purées. Despite not having any teeth, she wanted to eat whatever we were eating. Fantastic! Since this is what I wanted anyway. However, there are still some considerations that must be made when planning meals. I tend to make a lot of salads, and salad greens aren't really something a toothless 10-month old can manage without gagging. But I've found a good number of meals that satisfy all members of the table. Including our dog, who gets lots of scraps these days. FAVORITE RECIPES. Black Bean Sweet Potato Enchiladas (Cookie + Kate) This is one of my all-time favorite recipes. I've written about it before. It's just so easy. So healthy. So delicious. And on top of all that, it's great for little ones. The sweet potatoes are so soft that they're easy for little gums to chew, and the black beans with cheese make for yummy and nutritious bites as well. Creamy Curried Cauliflower Soup (The Kitchn) So good! So easy! Delicious for all members of the family. Also freezes well. Red Lentil Dal with Tamarind and Asparagus (Food + Wine) I make a lot of lentil/dal dishes for W. They're easy to eat since they breakdown so much, and are also a good source of protien and fiber. I really liked this recipe though, because it introduces some new flavors - tamarind and asparagus. Asparagus tips are easily chewed. W wasn't sure what to make of them at first, but started to like them after a few tries. I could go on an on...so many great recipes! Check out my pinterest pages for more ideas!